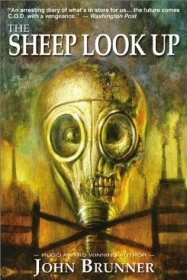 This book presents the reader with a story about the Earth in several years, with a very pessimistic view, on the edge of “dark-future” Cyberpunk. In a world where the American president is nothing but a figurehead, USA’s biggest export is dirty air, and daily weather reports tell you how polluted the air is today, a group of people -- the Trainites -- try to fight back for Mother Nature. Inspired by the books of one Austin Train, the Trainites act on two levels: living the right life, eating only natural food, etc. as well as fighting physically. They are fighting an uphill battle, but finally, things begin to change. It’s interesting to note that Brunner creates a fictitious aid organization called “Globe Relief.” Any connection with the modern real-world “Global ReLeaf” organization? Although dealing with different moral issues, one cannot avoid the striking similarity between The Sheep Look Up and Brunner’s Stand on Zanzibar. It begins with the writing style (newspaper extracts, a multitude of characters, and other aspects, although in this book the style is a bit more subtle and mainstream), but it’s most noticeable when comparing the two main characters - Chad C. Mulligan (from SoZ) and Austin Train. Both are scientists who got rich from writing books with provocative names (here, these are Guide to the Survival of Mankind, You Are What You Have to Eat, and A Handbook for 3000 AD, among others). Both tried to warn humanity of forthcoming disasters, and both decided to leave it all and live like homeless poor men (although for different reasons). In both books, these heroes change a lot of things when they decide to re-emerge into the public awareness. However, just like The Sheep Look Up in comparison with Stand on Zanzibar, Train, when compared to Mulligan, is a bit more subtle and less rude, less cynic, and more scientifically accurate. Perhaps the most noticeable effect of SoZ on its reader is the future-shock it creates, and the beautiful way in which the reader is immersed with the fictional future described. To me, at least, this effect was lacking in The Sheep Look Up. It is more of a mainstream book, protesting, like many other books before and after it, against humankind’s abuse of nature. The third volume in Brunner’s American Trilogy is The Jagged Orbit.